We wish we had a pound for each time we were asked that one! And the answer..., well, its not that straight forward. Conditions vary enormously and the best advice is always to try and use the available resources to check a few days ahead if you can. Snow can fall on our mountains from late summer through until spring, but generally, accumulations won't really build up until at least mid/late December. With freeze/thaw cycles and strong winds as well, winter in the mountains can be unpredictable. That said, catch it on a good day and it can be absolutely fantastic. Late season (March/April) can often be excellent with good accumulations, long daylight hours and less cold temperatures. 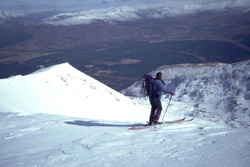 Your local accommodation - Most businesses in the Glencoe area will receive details of conditions at both ski areas each morning during the season. Again, a very popular question. 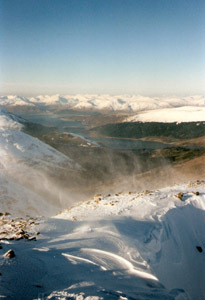 Contrary to popular belief, the Highlands isn't a barren Arctic wilderness in winter and, at sea level at least, is usually relatively mild. Chances are that when it snows you'll have more problems in your local area than you will here. The road over the Rannoch Moor rises to over 1000ft above sea level and can get a bit wild. However, closures are rare and often short lived - and there's always the coast road via Connel Bridge in extreme cases, an addition of about 40mins to your journey. So the next time someone rings and asks, "What are the roads like?" The answer will be "Long and black with a white line down the middle!"